Is your deck, pergola, porch or fence in dire need of a cleaning? Decks are many times the areas we forget to maintain. 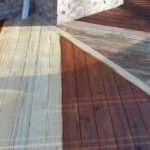 Most of us think that after your deck was stained once, it does not need to be stained again for many years. That is not true. Decks, pergolas, docks, should be cleaned and stained every 2 years. By staining every 2 years, you can protect your wood and your initial investment cost of your decks, pergolas or docks. At this point a small amount of money spent on pressure washing & staining can make a huge difference as well as peace of mind.